Qi'ire is a garden world with a near-ideal environment conducive to most forms of life. The system supports a population of fewer than 10,000 sophonts. It is a Human dominated Non-Aligned world in the Lamas Subsector of Deneb Sector. Qi'ire is a garden world with a near-ideal environment conducive to most forms of life. The system supports a population of fewer than 10,000 sophonts. It is a member of Wilds in the Lamas Subsector of Deneb Sector. In antebellum times, Qi'ire was a neutral buffer zone world situated between the Third Imperium and the Vargr Extents. Its human population was a diverse and fractious lot, and was broken into small family-sized collectives. The population subsisted on trade between the Imperium and the Vargr, maintaining and servicing the ships, and entertaining the crews that used their port as a transit point. Many of the collectives were commercial concerns, with families competing for business contracts in areas like hospitality, maintenance, security and administration. 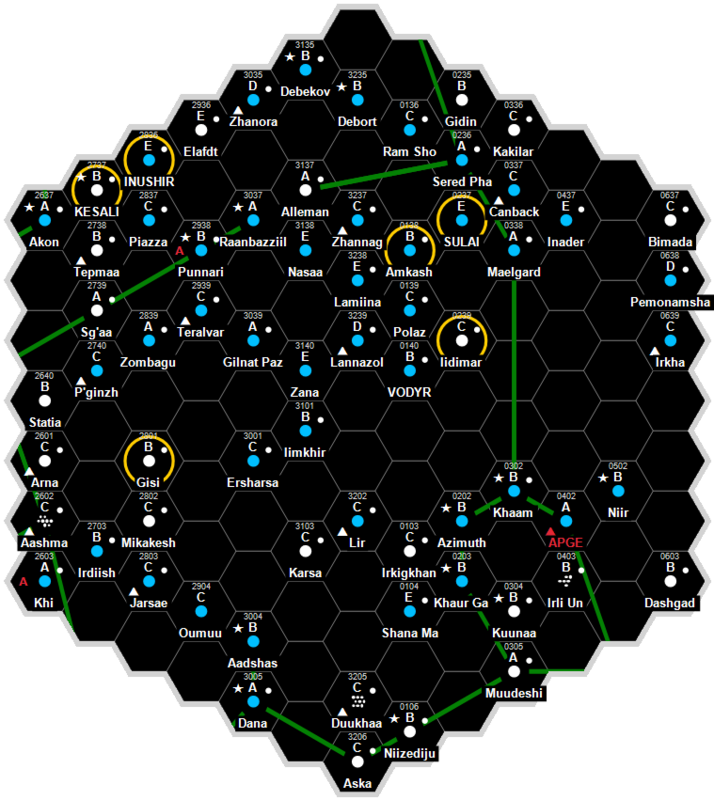 Though the competition was fierce, it was restrained by a common legal code shared by each group, and the starport and its environs was considered to be communal property. The Civil War standoff between the Domain of Deneb and the Assemblage of 1116 caused border trade to shrivel up completely, and Qi'ire felt this economic pain. Though not Pro-Imperial, the severity of Vargr corsair raids forced it to rely heavily upon DoD naval patrols to protect it. Virus and the subsequent Collapse were even less kind; the newly declared Regency established its Frontier borders in a way that left the world just outside in the Wilds. About fifty percent of the population had evacuated, due to both the Vargr and Virus, and the remaining population consolidated their technology and infrastructure the best that they could. Today the world is a valuable oasis for free traders wandering in the desert of the Wilds. Despite a major tech drop, the world's proximity to the Regency permitted it to keep it from dropping too low, and local maintenance crews can still do ship maintenance in their nearly immaculate starport. The world has been left nearly unscathed by Vampire attacks, the result of strong Regency naval patrols in this vital chokepoint system. The locals have regressed their government and law level to reflect the harshness of their environment, but remain strongly committed to each other and their general survival. To maintain their morale, and solidify their solidarity, the locals put on a carnival every two local years. This is less of a celebration in the traditional sense than a time of feasting, serious discussion and relaxation. Family elders discuss business, politics and security over heaping plates and large amounts of alcohol. Marriages are arranged, personal relationships are explored or cemented, and offworld diplomacy is handled. Free traders and other offworld crews are treated as honored guests, and are importuned into joining these festivities. Many offworld parties use the festival to handle their own business or to cement major transactions. Some free trade collectives use it to time reunions of their scattered vessels and crews, who convene to show off and trade their accumulated wares. Dave Nilsen. The Regency Sourcebook (Game Designers Workshop, 1995), 53. This page was last modified on 25 September 2016, at 19:01.